Here’ s a stat that might interest you: according to a recent poll by Le Monde, Marine Le Pen is the most favoured candidate among voters between 18-24, with 26% of the vote. The results appear even as Le Pen has lost momentum in the presidential race, losing her third position to the far left firebrand Jean-luc Mélenchon. Even if Le pen fails to make it to the second round of the election, which is the probable scenario, the poll results give an interesting insight to the trajectory of French politics. 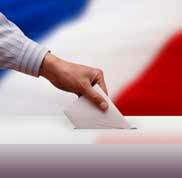 The verdict is that the Front National is ( or at least will be) a force to be reckoned with in French politics. With the socialist François Hollande trailing Le Pen scoring 25% of the votes, the poll also attests to am increasingly divided french society. But a separate research conducted by a London Research and advisory group Counterpoint, helps shed some light on the poll results. Studying different categories of Front national support in 2007, the research identified three distinctive groups. “Committed Radicals” were those who said they would vote for the Front National and felt close to the party; “potential radicals” who said they agreed with Front National’s ideas but would not vote for it and ” reluctant radicals”, who said they were likely to vote for the Front National but did not feel close to the party’s ideas. Intriguingly enough, the research found that 80% of eventual Front National voters belonged to the category “reluctant radicals”, and 13% to the “potential radicals”, a fact that also explains why the Front National tends to score higher in the election than in the poll results. 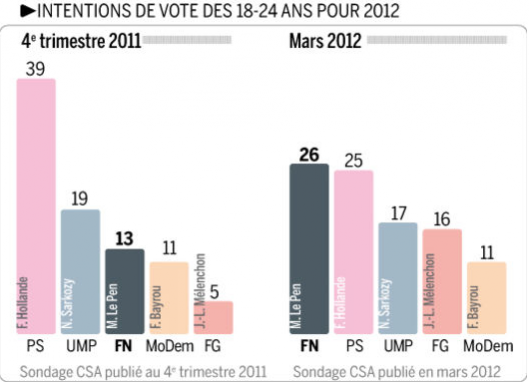 Putting this insight next to the findings by the Le Monde poll could lead to the conclusion that a considerable proportion of Front National’s support among the youth may also consist of “reluctant radicals”, who don’t necessarily share the party’s ideals but do not see any better alternative. In a nutshell, support for Marine Le Pen does not reflect the appeal of her ideas, but rather the disillusionment of the youth with mainstream political parties in France. Why not admire her? She, at least, is trying to advance herself and her ideas. You may not agree with her, but she is at least making an effort. Her campaign was not without fault but whose campaign wasn't? If she had the media treating her as kindly as they do Hollande, she would have been much more successful. Why admire Hollande? The man is deliberately without personality. He does not want to offend anyone and thinks that that means everyone will love him. Sarkozy has nothing to be ashamed of. His critics don't remember that he wanted to and tried to start making changes when he was elected, only to be blocked at every turn by...the unions, the Socialists, the media, etc. Why fight a battle that you will never be allowed to win? He did have ideas. But no one was willing to accept that they came from HIM.